Paradise POS software is sold through a worldwide ecosystem of trusted point of sale (POS) resellers. We are committed to helping our channel partners drive revenue growth and profitability through their partnership with our organization. Through our channel program, Paradise POS resellers have access to variety of value-added benefits including extensive industry knowledge, sales and marketing resources, and world-class customer support. Our team is committed to continual product development and innovation, adding features that empower our partners to offer state-of-the-art POS software. The best way to grow our business is to help you grow yours. Discover how our channel partners earn great margins, which increase with higher tiers of sales performance. Whether your customer has a quick question or needs step-by-step assistance with a complex task, one of our trained support specialists is ready to help 24 hours a day, 7 days a week. Tired of competing with your vendors? We protect our channel partners by not competing directly with them for end user business. Use our existing marketing materials or co-brand them to give a consistent and professional sales pitch. Leverage our team of industry and product experts to help your organization close more business. We are invested in building our brand. Ask about joint marketing activities designed to enable us to help you grow your business. We offer in-depth training programs that ensure our channel partners have the confidence to sell and service Paradise POS software. Our culture of continuous product development enables us to quickly develop features to meet customer needs. Create a positive user experience. Reference our list of certified hardware to ensure seamless integration. 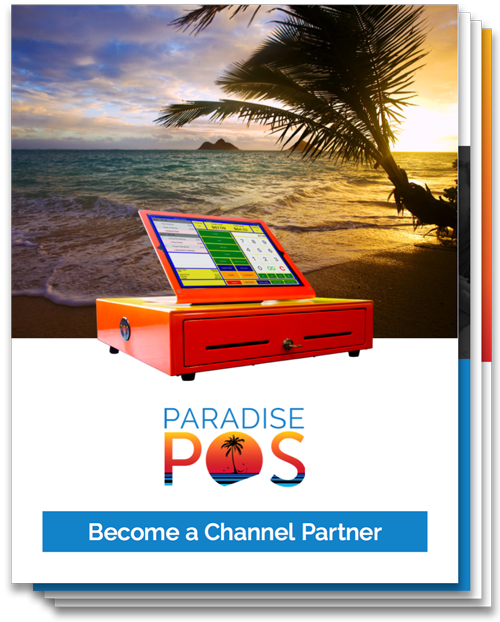 Download this channel partner guide to understand the benefits of working with Paradise POS and to get the details of our channel partner program. Take the next step and become a Paradise POS partner!